Upon Derrick Rose’s return from Turkey, in which the USA National Men’s Team won gold at the FIBA World Championship, he decided to reward himself with some time off. Well, sort of, as Rose only enjoyed one day of down time. Rose simply couldn’t stay away from the gym. On just his second night back in Chicago, he was back in action taking jump shots when his phone rang. It was his agent, B.J. Armstrong, who had a feeling he was on the court and sure enough, he was right. “I don’t know how he found out, but he just told me to get some rest and take a couple of days off,” laughed Rose. As two-a-day sessions at training camp commence on Tuesday, though, there is little concern that Rose’s non-stop summer will be an issue. Youth is on his side—he turns a mere 22 years of age Oct. 4—and he’s already a proven he doesn’t know anything less than full speed when it comes to basketball. 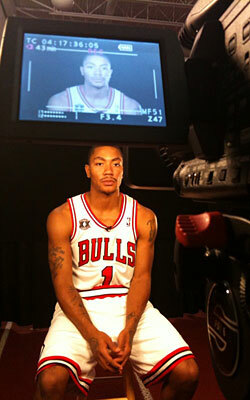 If Bulls Head Coach Tom Thibodeau has any plans to temper Rose during the preseason, he didn’t indicate that on Monday. Rose’s experience with the Men’s National Team has made his hunger for winning as strong as ever. At the Bulls’ media day, he pointed out that winning at the Worlds was his first championship since his Simeon squad won back-to-back titles in high school. He hopes that the experience he acquired overseas will translate to greater success in the NBA. Another area in which Rose benefitted from this summer was on the defensive end of the court. Given Thibodeau’s well-known emphasis on defense, listening to his star player talk about his responsibility as a defender must have been music to his ears. In an offseason which saw elite free agents switch teams in unprecedented fashion, players are regularly asked about LeBron James, Dwyane Wade, Chris Bosh and the Miami Heat. But Derrick Rose isn’t worried about what could have been in Chicago. He’s more than content with his team as he prepares for his third professional season. One of those players is Carlos Boozer, whom the Bulls quickly signed to a five-year deal after James, Wade and Bosh made their intentions public. Having a prototypical power forward on the blocks will certainly help Rose, said Coach Thibodeau. “His versatility is a great asset,” said Thibodeau of Boozer. “It starts with his post up game and the thing that often gets overlooked is his ability to pass out of the post. He’s a terrific passer. When the ball goes in and we cut, those are other opportunities to get easy baskets. Just as Rose’s expectations for his team are elevated, he also has bigger and better things in mind for himself. His resume includes winning NBA Rookie of the Year and becoming the first Bulls All-Star since Michael Jordan in 1998, and he’s just getting started.